Welcome to the Alderwood Unit! The Alderwood Unit (ASAR) and its members respond to all county call-outs and also serve as members of our Special Operations Group (SOG). The SOG is composed of several teams: 4×4 Team, Helicopter Rescue Team (HRT), K9 Team, Man Tracking Team (MTT), Mountain Bike Team (MBT), Equine Response Team and the Swiftwater Rescue Team(SRT). These teams provide highly specialized skills and technical rescue capabilities to Snohomish County Volunteer Search and Rescue, the Snohomish County Sheriff’s Office, and the Snohomish County Department of Emergency Management. We are on call 24 hours a day, 365 days a year. The ASAR board is composed of elected representatives from within the membership, our elections are held yearly. You may contact any of us via e-mail by clicking on our names (below). 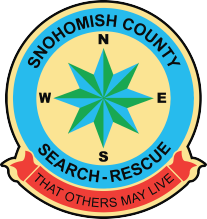 The Prospective Member Packet and additional membership forms located on our volunteer page provides more information regarding how you can join Snohomish County Volunteer Search & Rescue (SCVSAR). If you have additional questions, please e-mail the Alderwood Personnel Officer. Alderwood Search and Rescue (ASAR) meetings are held on the third Tuesday of each month, from 7-9:00PM at 18800 44th Ave. W. Lynnwood, WA 98036. PARKING: We do not have access to the “Fire Department Only” parking around the building, so please do not park in those spots. Additional parking is located across the street. Please feel free to join us if you’d like to know more!